Image courtesy of The scammy notices sent out to consumers look like bills and give you multiple ways to pay, but the small print indicates that it is "not a bill." All around the country, people are receiving subscription renewal notices from a company called Readers Payment Services (or various other names) for any one of dozens of newspapers. The invoices, which ask for your credit card and personal information, may look legitimate, but the newspapers are warning their subscribers to not fall for this scam. 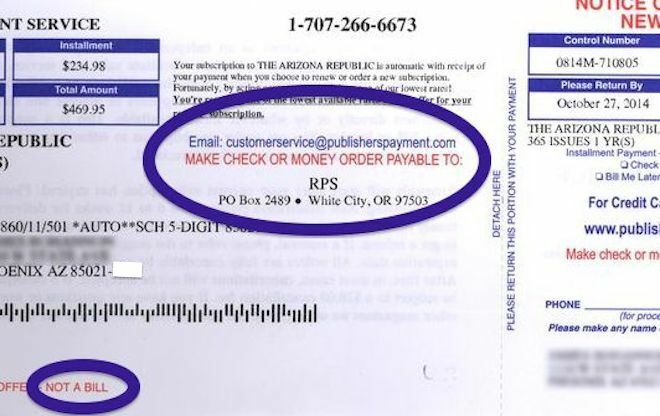 According to the Arizona Republic, it has received at least 60 complaints from readers who received these bogus Readers Payment Services, which not only want to steal victims’ info, but are also overstating the actual renewal cost by about 20%. Dozens of other papers’ have been targeted by the scam as well. • Notices may reference a Renewal Notice, Notice of Renewal, or New Order and include a request to make checks payable to a company other than The Atlanta Journal-Constitution. • The unauthorized renewal offer directs payments to a PO Box on Lemmon Drive in Reno, Nevada, a PO Box in White City, Oregon or 850 S Boulder Hwy in Henderson, Nevada. These bogus invoices may constitute mail fraud, and the U.S. Postal Service has confirmed that it is investigating. Reporters for the Republic contacted Publisher’s Payment Processing, the company in New York that ultimately processes all of these scammy charges, but couldn’t get anyone there to provide any useful information.